We don't tell the children at Woodland Park that they must take part when it's time to tidy up the place, but most of them, most days, do. "The blocks go in these orange boxes." "I see a block on the floor." 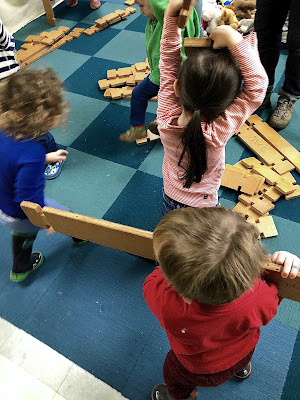 The power of informational statements is that instead of commanding children (e.g., "Pick up the blocks," "Put them in the orange box," "Stop playing, please"), we create a space in which children can think for themselves instead of just react: It's clean-up time, there's a block on the floor, I can pick it up and put it away. 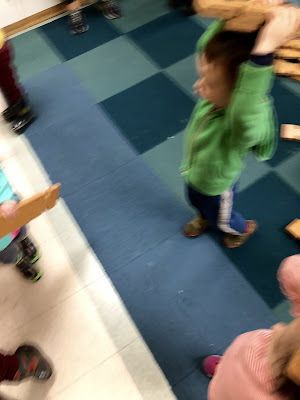 When we command, even if we add the word "please" at the end, we leave children with only two choices, obey or disobey, while when we simply make statements of fact we greatly increase the odds that any individual child will make their own decision to participate. "I see Claudio putting away a long block." "Sara and Monica are carrying a block together." "Wow, Arnold is carrying five blocks!" 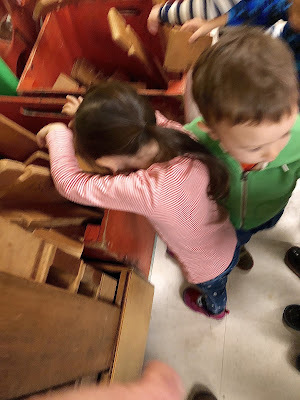 On Friday, I was making these sorts of informative statements as the two-year-olds were putting away our builder boards. 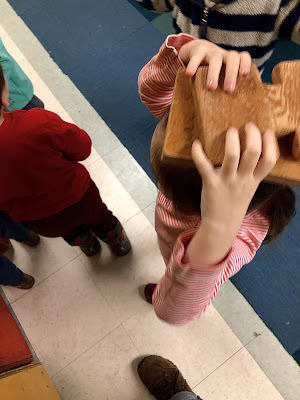 One of the children was carrying a block atop her head. I said, "Amy is carrying a block on top of her head." Within seconds, nearly all her classmates had their own blocks atop their heads, each making eye contact with me as they passed me on the way to the orange boxes where we are temporary storing the blocks, waiting to hear their own name, so I obliged: "Claudio is carrying a long block on his head, "Sara is carrying a small block on her head," "Monica is carrying a medium block on her head," "Arnold is carrying five blocks on his head . 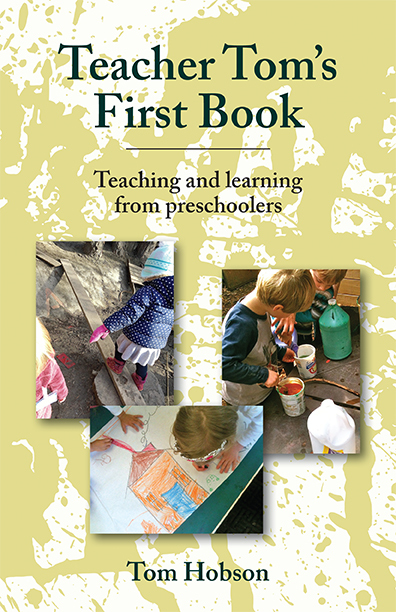 . ."
It was not the most efficient way to put away the blocks, but that's hardly the point. 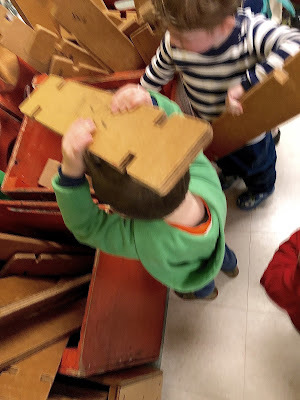 When we were done with the blocks they then turned to the stuffed animals of their own accord, eager to keep carrying stuff on their heads, so I just went right on narrating the story of "us" I saw unfolding before me.